Elliott started getting sick as soon as I brought him home last night. He was extremely congested, fussy, and slept pretty terribly all night. The thing about Elliott is that it's very hard to tell when he's sick because he's generally so happy. You can tell he's sick by his temperature or the fact that he is sniffling uncomfortably but generally he still displays his normal joie de vivre. 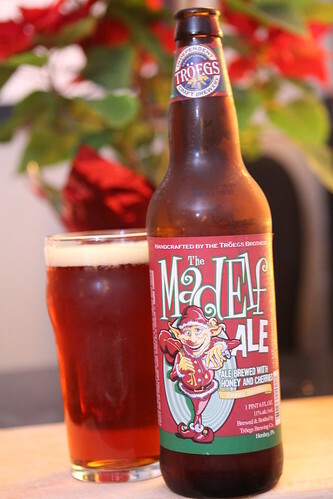 Last night after picking up the guys, entertaining and feeding them, and Jen getting home late from work we only had time to heat up some leftovers and enjoy this extremely potent The Mad Elf Ale from Tröegs Brewing Company. This was a very flavorful, full bodied beer with a deep red color and a subtle flavor of the cherries used in its brewing. I'd highly recommend this one for anyone's Christmas Beer list. It goes particularly well while rocking your sick child with one foot. Tonight I threw together some of the items Jen had prepared for making chicken pot pie. 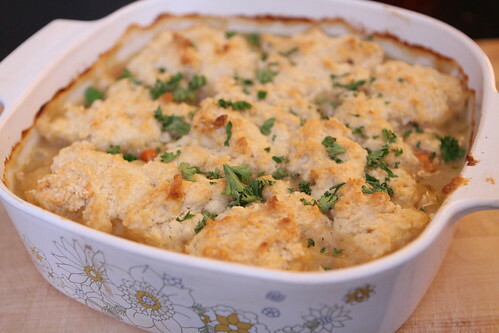 I sauteed some onion, celery, and carrots, threw in some poached chicken breast, used some turkey stock which I thickened with roux, and topped it all with a biscuit crust and topped with chopped parsley. 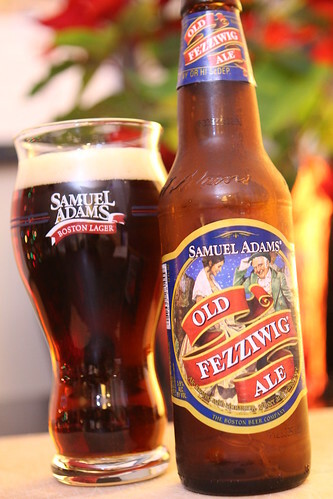 To go with this we broke into another Christmas beer, this Old Fezziwig Ale from Sam Adams. We enjoyed this one quite a bit and I pushed Jen to point out that it had "roasty toasty" notes. She learned this term the other day when she watched an episode of The Master of Hoppets. Much to my surprise she really enjoyed this show. She liked it partly because the Master of Hoppets himself is very charming, and partly because she likes the idea of a Danish guy using the term "roasty toasty." We've watched a few versions of A Christmas Carol already this year. As the Wombats sleep we will go through our Christmas movie archive in hopes of finding another version for tonight to celebrate our Old Fezziwig Ale. Then we will unwind and drift off to sleep. Then we will be awoken by the Ghost of Christmas Fuss! Thinking the picture of Elliott at the begiining of this post is outstanding. Good job by both the subject and the photographer. Thanks. It is one of my favorite pictures ever!